In our ongoing series about Handling common image file formats in Java we move our focus onto how we can read SGI images in Java. SGI (Silicon Graphics Image) is a file type of images with the extensions .sgi and .rgb. It has 2-channel support (.bw for black and white), 3-channel support (rgb/bwa) and 4-channel support (rgba). The ‘a’ represents alpha. There are not many libraries out there that can read SGI images. 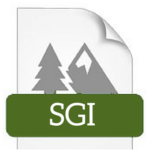 Our JDeli Image library can read and write a very wide range of image formats, including SGI. Here is the full list on Image file conversions supported. How to read SGI images in Java?